Today we are speaking to Trish Delleva, otherwise known on Instagram as @Teaplnt! She is an avid member of the Phoenix plant community. My name is Trish Delleva and I am 21 years old. Where in Arizona are you located? I am located in Surprise, Arizona. Exploring the Arizonan landscape led to a deeper curiosity for plants. I am a freelance photographer currently attending Estrella Mountain Community College. I will be attending NAU next semester as a biological ecological major. Plants are often present in the pictures that I take. What started your interest in plants? Before moving to the US from the Philippines, my Father collected and sold plants. This cultivated my interest in plants from a very early age. I am currently obsessing over aroids and caudex plants. How would you describe your plant collection status? My bedroom is completely full of plants, and I have various plants in other spots around my house. I estimate I own around 65+ plants. What about plants intrigues you? Watching a plant grow from a tiny cutting, learning about their practical applications, learning about the numerous varieties of plants and their origins. 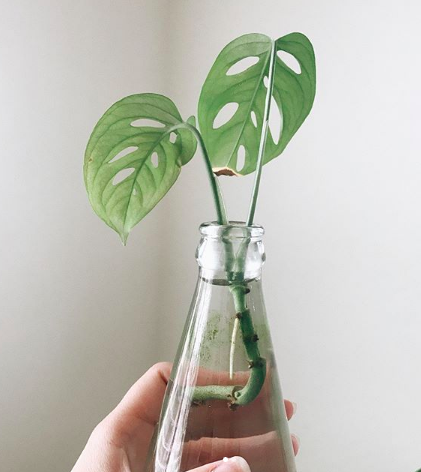 What inspired you to create a #plantstagram? I initially did not intend to make a plant themed Instagram, but two years ago I went home to the Philippines and took a picture with my “tito’s” tillandsia (which he crossbred) which was so large - nearly the size of my torso! I received a lot of attention from this post, so I decided to showcase my personal collection also. How has the Phoenix plant community shaped your collection? I’ve done trades with other members of the Phoenix plant community, been inspired by other people’s plant collections, and been a customer at many local shops to expand my collection. Are there any upcoming projects you want to tell us about? I am helping @theleaflet_ with a plant swap in October. I am honored to be recognized as a plant collector in Arizona, as well as a member of the plant community. Thank you for considering me for this interview. We wanted to take the time to thank Trish for being interviewed! Be sure to follow her on Instagram at @Teaplnt.